Seventy-three rocks, representing the 73 victims of the 1997 helicopter disaster, stand out against the sky where the horrible accident occurred 11 years ago, as part of the new official monument commemorating the tragic event. 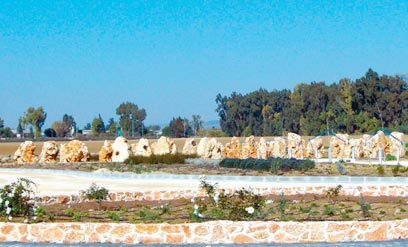 The monument, located near the cemetery of Kibbutz Dafna, will be inaugurated during the coming week. The accident, which claimed the lives of 73 IDF soldiers, took place after two Yasur helicopters en route to Lebanon collided in midair on February 4, 1997. The site was designed by sculptor Danny Caravan, architect Shlomit Shlomo, landscape architects Haim Cohen and Gilad Sharon and sculptor Rami Feldstein. "The main concept of the site was to convey the message that all the fallen were equal as humans, but that each had his own personality. This is why we used differently shaped rocks," explained Yossi and Raya Effner, the parents of Staff Sergeant Avi Effner who was killed in the crash. "It's important for us to show that new life emerge from death and memory. This is expressed by the water, the green vegetation and the anemones planted in between the rocks." 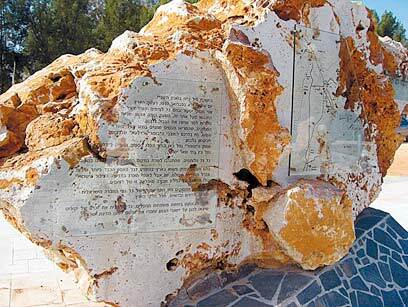 Eli Ben-Shem, chairman of the Yad Labanim organization and a bereaved father himself, said: "After so many years, most of the parents and the members of the commemoration committee are relieved that we have finally been able to commemorate our sons properly. "Gladly for us, we have been involved in every stage of the planning process. Once the environmental development works on the site are completed, it would be declared a national commemoration park." How to get there: From Road 99 (connecting Kiryat Shmona and the Golan heights) turn south at Hurshat Tal to Road 918. after several meters, turn left to a local road leading to the Dagei Dafna restaurant. From there turn right and drive towards the monument, which is located near the kibbutz's cemetery. See all talkbacks "Helicopter disaster monument inaugurated "